Over the summer I read a book called Transitions, by William Bridges, which has to go down as one of my favorite, most influential books I've read in 2009. Bridges looks at the internal shifts (transitions) that happen in a time of change (which he defines as the external shifts). I picked the book up at the encouragement of my spiritual director, as I explore this big change of becoming a published author and the transition (i.e. internal changes) that is occurring. So transitions have been on my mind a lot, and it seems that many people actually become more introverted (defined broadly here as "inwardly oriented") during times of transition. I have a good friend who moved recently and started a new job, and though she is an extrovert, she found herself with much less relational energy for the first couple of months, and she relished solitude much more than usual. Since introversion and extroversion is actually a continuum (not a dichotomy) that totally makes sense. There are times when we slide on the scale, though most of us have a pretty consistent preference (though we may not discover our preference until we really meet ourselves, in our 20s and 30s). Of course, the shift in my friend on the scale could be attributed to other factors - a shyness that developed in a new context, or a grieving process that acknowledged the end of her old life. But introversion and extroversion is more fluid than some people think. It seems fairly common that as people get older, they may discover a more introverted bent. Younger people just have more social and physical energy (and let's be honest, hormones which propel them more frequently into social situations), and as that youthful passion starts to fade, they may discover they're more introverted than they realized. "The truth is that, although ours is a youth-oriented culture, many of us do not come into our own until our lives are half or three quarters over. Schopenhauer noted this more than a century ago, writing that each person's "character seems best suited to one particular stage of life, so that he appears at his best in that stage of life." The author goes on to ask "What would you say is your own natural stage of life? Were you born to be seventeen or seventy? Are you a perennial twenty-five-year-old, or are you still waiting for your entrance cue at fifty?" The reason this section was so significant for me was that people told me all through my childhood, all the way through my 20s, that I seemed a lot older than I am. I always found that comment a little offensive, but I'm wondering how much of that had to do with my introversion. How many of you introverts out there have been told that? In my childhood, I tended to observe in group settings more, enjoyed time to myself, didn't jump into the action very often, and didn't outwardly express much excitement or passion. Characteristics that are all typical of much older people. What do you think? Was this your experience? I was actually very happy to turn 30, because I feel like it gives me permission to be a little more reserved and thoughtful, a little less impetuous and enthusiastic, which is a good look for me. What do you think? Are introverts better as they get older? Are we more suited for a later stage of life than extroverts? My friend and mentor Mark Roberts (and fellow introvert) is beginning a series on online church, a growing movement that holds interactive church services on the internet. Mark is always thoughtful, balanced, and biblical, and I'm eager to read what he has to say about this phenomenon. It occurs to me that many introverts will be attracted to online church, and I'm curious to hear your thoughts. He approaches it from the perspective of one who is just learning about it, so if it's new to you, you'll resonate with his viewpoint. For those of you who haven't heard about it, there is a live event taking place right now called The Nines. It's a conversation sponsored by Leadership Network and Catalyst, and it features nine minute blurbs from some top leaders and thinkers in the evangelical emerging movement. It's happening today, on 9/9/09. It's a really creative event, with some really amazing speakers. It was the #1 trending topic on Twitter for a while this morning, and all the extroverts are out in force, "processing" through typing. But I just can't watch it. Rapid fire bursts of disparate information, with no time to process in between, just destroys my introverted brain. I think if I watched 3 in a row my head would implode. And I can't help but think that this event is really representative of a bias towards extroverted ways of thinking and acting that pervades much of evangelicalism today. The good news is that you will be able to watch it later, one at a time, at your leisure. That is what I will be doing. What was your motivation behind this project? To be honest, the book started out as somewhat of a self-apologetic. There were two unmistakable realities in my life – 1. I was called to be a leader in the church and 2. I was an introvert. 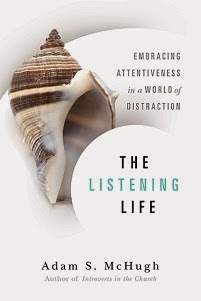 But too often I experienced those two things as contradictory, and the book began as my way of trying to make sense of my call in light of my introverted temperament and vice versa. But as I thought about the topic and started talking with other introverts about it, I realized just how prevalent, and often how crippling, the struggles are for introverts in the church. So I decided to address not only leadership, but also spirituality, community, worship, and evangelism through an introverted lens. What do you hope folks will gain from this project? My hope is that the book will help introverts both to find peace in their God-given personality preferences, and also to discover their places in their Christian communities, which so badly need their gifts and strengths. How were you personally impacted by working on this project? It was a very healing process for me, to think deeply about my introversion and how that actually aids me in my life of discipleship. I loved talking with other introverts (one-on-one, of course!) about the topic and sharing struggles and hopes with them. There are a lot more of us out there than people might think and we are much more committed to the Church than people might think too. We are eager to discover our gifts and to use them for the blessing of others, as well as to engage in the Missio Dei. We just want to participate in ways that are authentic to who we are. SD: What do you think is the most troubling general misconception about introverts? LH: Wow -- it's hard to choose. I am very troubled by the tendency to define introverts by what they lack. Introversion is a preference, not a fallback plan. Introverts like being introverts. We are drawn to ideas, we are passionate observers, and for us, solitude is rich and generative. Think of all that goes on in the playground of solitude: daydreaming, reading, composing, meditating -- and just being, writing, calculating, fantasizing, thinking, praying, theorizing, imagining, drawing/painting/sculpting, inventing, researching, reflecting. You get the idea. First, IVP just told me that chapter 6 of my book on introverts in leadership will be adapted into a feature article in the Christian Century, in either October or November!!!! I am incredibly excited about this. 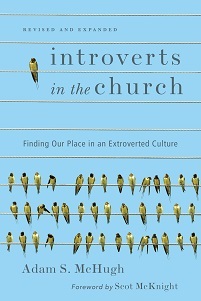 Second, I'm told that Amazon has almost filled its first shipment of pre-ordered copies of Introverts in the Church. (Don't ask me why they have a set number of books they order before it comes out.) So if you want a copy when they first ship, buy now and you should have it around the middle of October. Otherwise it will be another couple of weeks, probably closer to the beginning of November. JAR: What does it mean for introverts to be missional? To engage in evangelism? Do you have any examples to illustrate? AM: I saw a blog post a while back that called introverts “sugar in the missional gas tank.” I was surprised by the lack of nuance and thoughtfulness in that post, but even more so I was startled that many commentors actually agreed with the author. Clearly, in many circles introverts are trying to dig themselves out of a deep hole, and maybe my book, if nothing else, will make a good shovel. It is a false dichotomy to say that extroverts do the work of evangelism and outreach, and introverts do the work of spirituality and prayer. It’s not a matter of different activities; it’s a matter of different ways of doing many of the same activities. Introverts can do evangelism, introverts can engage in the missio Dei, and if we are not, we are missing out a key and vital part of our discipleship. For introverts, the most important aspect of mission is context. We will likely to be better in one-on-one contexts than we will be in large groups, and we will likely be better with the same people over time than we will be with encountering strangers. If we center our strategies for evangelism and mission around our personal interests, then we will have more to say and we will find more energy from it. If we find ways to use our natural skills – listening, behind-the-scenes service, compassion, creativity and imagination – in our outreach, then we will be more successful. I have an introverted friend who is an amazing sculptor, and she told me that she views her art as a wordless way of communicating the gospel. It’s not just that she hopes her art will become a conversation starter, but she prays what she sculpts will actually be a vehicle for mediating the presence of a creative, tender God. She knows that evangelism requires words as well but that God transcends and is more mysterious than any of our verbal formulas and homilies we so often us to try to bring someone to faith. JAR: Tell us something about yourself that is completely odd and random. AM: I have this weird thing for cats. I have 4 of them and I experience this odd resonance with them because cats are introverts. Sometimes when the doorbell rings I fantasize about running and hiding under the bed with them.